"If the letter of Sri Raghuram Rajan is acted upon, PMO should have explained the same, if not acted upon, should have mentioned it, and if there is any objection based on any exception, the PMO should have pleaded such provision and justify their denial. Instead, the PMO refused to comply with the direction of disclosure of action on letter of Sri Raghuram Rajan, on grounds which are not legal. It’s unfortunate. It has moral, constitutional and political duty to tell the citizens of India as to who are and what action was taken against defaulters to recover the huge loans advanced to them by banks, from out of tax payer’s money. It is not justified to deny the right of the people, who are sovereigns, to know who evaded thousands of crores of rupees loans, what action was taken against them by their representative government, banks and the RBI, being a central bank with statutory regulatory functions", observed Information Commissioner Professor M. Sridhar Acharyalu in a 67 page order issued on November 16. The Commission directed the officer of higher designation in the PMO to inform the applicant and Commission the names and action taken on the defaulters for recovery of loans in response to the letter from Sri Raghuram Rajan and the policy, if any, about recovery from defaulters including high profile ones. The Commission also lambasted the RBI for its "anti-RTI" policy and wondered whether the Central Public Information Officer of the apex bank "knows the law". The RBI justified its non-disclosure on the ground that credit information of individual account holders are confidential under Sections 27 and 34E of Banking Regulation Act, 1949, Section 45E of the Reserve Bank of India Act, 1934 and Section 17(4) Credit Information Companies (Regulation) Act, 2005 . It was also contended that the RBI has obtained information from other banks in a fiduciary capacity and hence cannot be disclosed under RTI. However this defence was not accepted by the CIC. It was pointed out similar contentions raised by the RBI were rejected by the Supreme Court in RBI v Jayantilal N Mistry, holding that RTI Act will override provisions of other legislations. The SC held that Section 8(2) of the RTI Act permitted disclosure of even protected information under the Official Secrets Act, if public interest demands it. Section 22 of the RTI Act gave it overriding effect on other legislations. Also, the Information Officer has to act as per the powers of the RTI Act and not under other Acts. "In spite of Supreme Courts direction that Section 22 of RTI Act will override RBI Act and other Acts, the RBI again quoted those Acts and declared that it would not give information as per those legislations. The RBI has totally ignored these two provisions of RTI Act", observed the Commission. 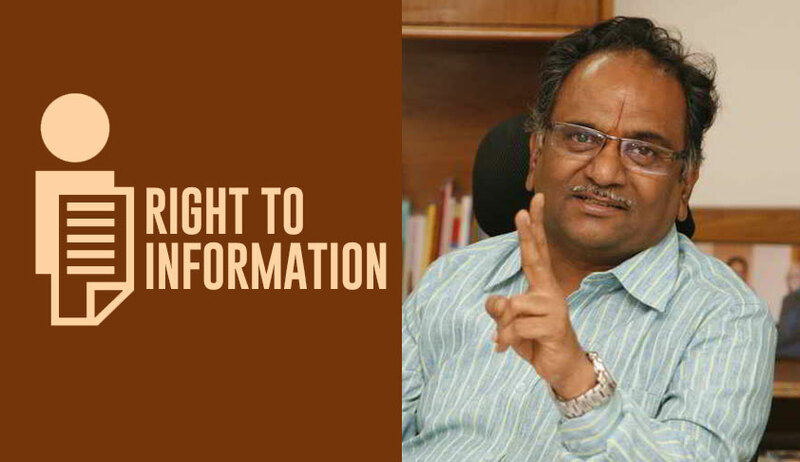 Professor Acharyalu, who is retiring today, also observed in the order that disclosure of information of wilful defaulters was justified in public interest. "The most important question which the RBI ignored is when hundreds of crores of rupees of public money is not repaid by a loanee, how that became confidential customer’s information? The RBI or other banks need not give personal details of the willful defaulters like their addresses, but why not they disclose the names of willful defaulters and amount they fell due, besides measures, if any, being taken to recover the money that belonged to people? Every evasion of loan is misappropriation of public money, which public have a right to know. Vibrant citizens have a democratic duty to scrutinize the way huge loans are being granted without securing them properly. It is an issue of financial administration, governance of public money and finally the people are affected by these maladies. The RBI, being a regulatory of banking activities have no legal duty to protect the interests of willful defaulters or their reputation misquoting all the provisions of law, which cannot be invoked. It is unfortunate that Banks and Government are waging legal wars on the citizens who are seeking information to protect the names and other details of willful defaulters, despite land mark judgment of Supreme Court directing them to abide by the RTI Act", the order observed. The CIC said that the RBI is supposed to uphold public interest and not the interest of individual banks or loan defaulters. On the basis of reports, it was observed that just 12 companies are estimated to account for 25% of the gross NPAs. About 7,000 millionaires shifted their residence outside India, or changed their citizenship ov, leaving the banks, economy of the nation, public exchequer and public sector banks bleeding. The gross NPAs of public sector banks have increased by a whopping 311% in between 2013 and 2017. On these findings, the CPIO of RBI was directed to disclose information to the appellant Sandeep Singh Jadoun. Apart from the issuing directions to divulge information, the Commission also directed the RBI to have an overhaul of its RTI policy to bring in more transparency. "If RBI does not respect the orders of SC and denies the citizens Right to information, it will result in perpetuation of financial regime of secrecy that is potential enough to facilitate financial frauds and allow fraudulent rich & influential business persons to flee the country, as witnessed in recent times. Most of the unhealthy financial trends could be attributed directly to the practice of secrecy founded in pre-Independence British legislations ignoring the recent reforms for good governance"
The Commission also recommended disciplinary action against the incumbent CPIO Mr Panigrahy and chose an efficient person as CPIO "who knows the law laid down by Supreme Court and does not suppress information from the Commission and the people, in his place"
The Commission directed the RBI’s RTI wing to revise, reform their section 4 disclosures and up date from time to time as per RTI Act, DoPT guidelines and order of Supreme Court. On November 5, the CIC had issued notice to RBI Governor Urjit Patel, considering him as ‘deemed PIO’ responsible for non-disclosure and defiance of SC orders and CIC orders.